FASTSIGNS® of Herndon, VA helps you solve your visual communications challenges – large and small. From the simple…to the simply impossible™. With our marketing and sign knowledge, state-of-the-art technology and project management processes, we craft the right message and create effective signs and graphics that meet your needs and make you the hero. Whether you need a single building sign or a thousand banners, you can count on us. 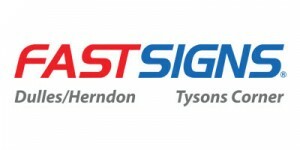 At FASTSIGNS® of Tysons Corner – McLean,VA, you get visual communications solutions including sign and graphic consultation, design, production, delivery and installation services. Whether you need architectural signs, vehicle graphics, point-of-purchase posters or a building identification sign, we can help. Meet your objectives – realize your full potential™ – and let us make you look great. Click Download Sponsor Packet for more information on how you can become a sponsor of FinishLyme.